Oh, I mentally kicked myself for not reading this book sooner. Why did I wait so long? 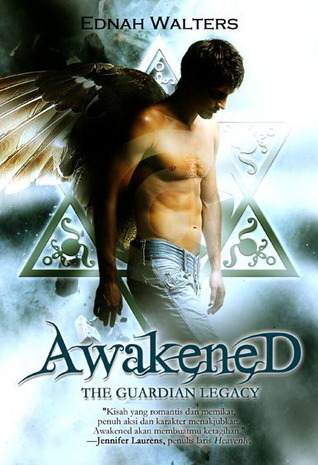 Awakened is one of THE most satisfying YA angel books I've ever read. The story sucked me in on the first page like some crazy vacuum and din't let go until the final period on the last page. I loved Lil's sassy point-of-view and convincing voice. She lives with her grandpa and thinks he's a circus gypsy. Wrong. Gramps is a Cardinal Psi Guardian trained to hunt down demons called Hermonites. When Lil is visited by a guy named Bran who carries a message for her grandfather, she'd better listen. Lil does, after she realizes she's not crazy, and relays Bran's words to Cardinal Falcon. From then on, Lil is literally thrust into a paranormal world she knew nothing about. Circus gypsy? Boring! Related to a Cardinal, Lil learns about the Tartarus gateway, the Damned Ones, the Circle of Twelve and a world of angels and demons. Oh, and I can't forget to mention the action and romance with Bran. Did I reveal that Lil finds out during a argument that she is a Guardian--a demon killer--and now part of this fantastical world too? Ednah Walters has created some unique characters to inhabit a crowded paranormal market. Make room for the Awakened series. Lil is a fantastic character--a nice mix of independence and spunky spirit. She is able to draw the secretive and mysterious Bran out of his shell. I LOVED Lil and Bran's chemistry, how they cared for each other, and how their mutual feelings increased over time (and not in seconds). There was none of the rushed I'm in love/lust found here. I enjoyed their scenes together. Lil attends a special center to train with a group of Guardians who have their own types of powers. This is a cool and diverse bunch to know and I'm glad they became her friends, her extended family. From the humorous scene-stealing Sykes, Kim, Remy and nice girl Izzy, I liked them all (yes, even Kim grew on me). I'm glad to see a paranormal world where adults are role models and work together with the teenage underlings. Balance and realism, two things not always found in this genre. Training sequences, battles with demons, mysteries revealed and more to solve, Awakened has a lot to offer readers: intense action, a new romance, blossoming powers, and bad guys to take down. These Guardians are a most welcome addition to the fantasy world of demons and angels. I was engrossed, enthralled and entertained--quick, sign me up for the Ednah Walters Fan Club! I prefer this second cover to the original cover.